Building Permits Are Now Available at the Police Dept. If you are new to the area, we are so glad to have you. If you’ve been away for a while . . . . Welcome back! You may be surprised at what you find here. When you think of Hiawatha, you might associate it with our beautiful maple trees, or perhaps the nation’s oldest Halloween parade. Maybe you are familiar with our growing downtown business district or perhaps our school district….one of the best in the state. Foundation for Economic Development (HFED), Hiawatha Chamber of Commerce & CVB, the Brown County Historical Society, Allied Community Enrichment Society (ACES), Kiwanis, Lions Club and many church groups. Maybe you have heard that our local police department has become one of the premier law enforcement entities in northeast Kansas, or that we have top notch schools, a thriving medical community and comprehensive hospital. Perhaps your thoughts turn to our beautiful parks, the City Lake, the Fisher Community Center, our aquatic park or, the walking and fitness trail. These are all great things about our city, but the real treasure we have here is the people . . . . good, honest, hardworking Kansans who make this a wonderful place to live, work, and raise and family. Hiawatha has experienced economic growth over the last decade. Our unique location at the intersection of US Highways 36 and 73, good rail access, great people and a positive attitude all have us ready for continued growth! We would sure like for you to be a part of it. 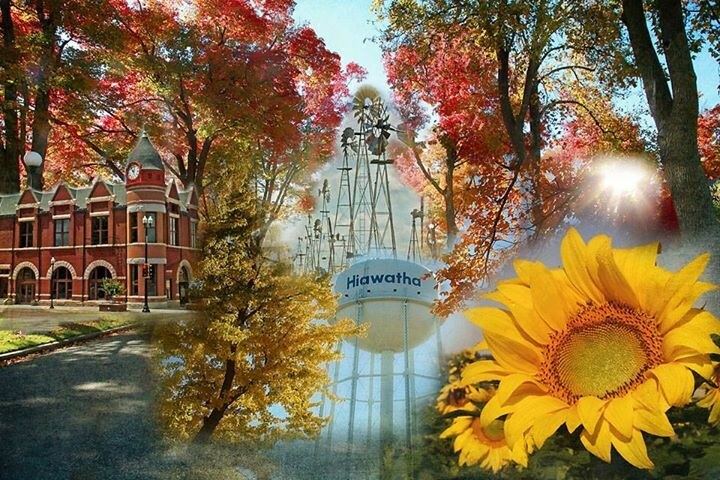 Welcome to Hiawatha! Copyright © 2013 by the City of Hiawatha, Kansas - All rights reserved.